Just spent an hour putting this together. It’s a member function for a Mesh class but you could pass in the Mesh. The name is misleading as it’s not actually doing a fill, it’s just colouring the vertices – it looks like a fill though. It should work with any sort of Mesh, including rodrigo’s MeshRoundRect or an image with a Scale9grid. You supply the angle, relative to the x-axis, in radians and two colours. 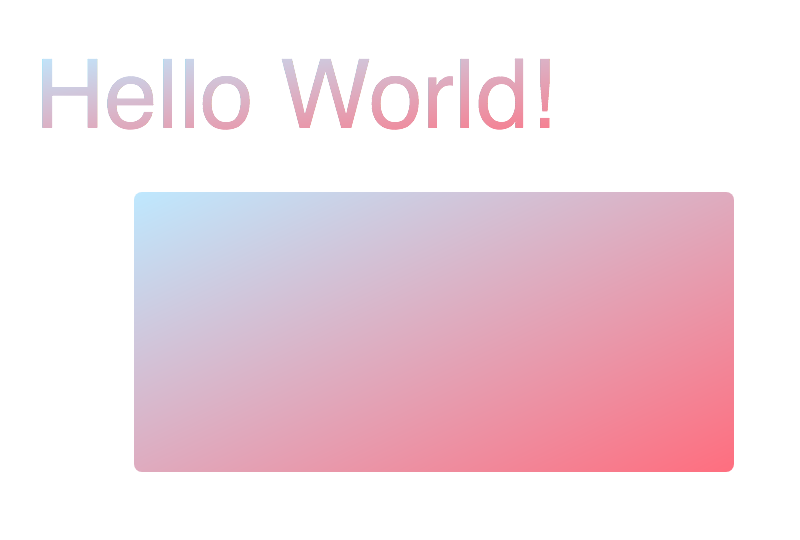 It works like a gradient fill in an art package where you specify the direction of fill. The two colours are the two extremes of the gradient, which goes from one extreme of the Mesh to the other, typically corner to corner or edge to edge. Note it’s not likely to be very fast, querying and setting every vertex individually, but I’ve not tried any performance tests. It works with Meshes with alpha, as the setColor function leaves the alpha in place (it reads it to do so which also makes it slow to call repeatedly). Thank for the contribution John, is very useful. UPDATE: just tested it, works great! Is it ok if I include your code in the MeshRoundRect class and give u the credit? Thank you very much for sharing John. This is incredible! Thank you very much! > Is it ok if I include your code in the MeshRoundRect class and give u the credit? Sure. I wrote it with rounded rectangles in mind. For some Meshes there may be easier/better ways, which don’t require going through every vertex. A rounded rect though doing every vertex individually is probably unavoidable if you want to interpolate into the corners. In my code I put it in my base Mesh class which everything else inherits from, but it could go anywhere. Can I directly use scale9grid to the mesh class? Such a code can be implemented with the image? It should work with scale9grid, though I’ve not tested it. Everything drawn in Starling subclasses from Mesh. A Quad is just a Mesh with only two triangles. An Image is a Quad with a Texture. Adding a scale9grid to an Image extends it by appending Quads, so by adding extra vertices to the Mesh. The Texture should be white, or mostly uncoloured. You should call this after setting up the scale9grid, and after any changes to it. Yep @denisgladkiy, works fine with scale9grid... the only thing is that you will have to subclass Image to access vertexData. take John's code, remove var vData from initialization, and add vData as the first param. // lets say you have a round rect texture ("round rect radius 12") with corner radius 12, and texture size 30x30. Ah yes, vertexData is protected, so can only be accessed in a subclass of Mesh. So you can’t just write a version that takes a Mesh, you need to do a little more as rodrigo describes. // wait for the TextField to be "recomposed" for the first time. (next render frame). // tween the gradient... but mesh batch will have only 4 vertices, so it will "snap" fast the tween. I am sure that many developers should appreciate your contribution! Not sure what you mean. An Image with a scale9grid is just a Mesh, so this should work, though with a bit of messing around as you can’t access the vertexData of an Image. Certainly you can use this on the fly. My point about performance was that it’s one of the most expensive Mesh functions I’ve written, because of the way it reads and then writes every vertex. But that cost is proportional to the number of vertices, and an Image with scale9Grid has only 36 I think – hardly any so the cost would be minimal. As for a hypothetical 'GradientImage' class, that’s how I create my graphics primitives. I decide what I want and then incorporate it into a class, normally subclassing another class of my own that does the low level vertex and index data manipulation. Everything derives from a base mesh class, into which I’ve added this function so I can access it from everywhere. I don’t know anything about Feathers components so whether anything else is needed to use this with Feathers. Im no expert in Feathers, but most components have properties that accept defaults starling DisplayObjects. And components that have states like buttons or input texts, can have or one displayobject per state, or a SkinImage that stores references to textures per state. If you need some sort of interaction with GradientImage, better subclass it and implement IStateObserver interfase so u can listen to the parent component state changes... you can basically copy the implementation in ImageSkin and add ur own logic for each state change (like tweening colors or the angle). Is that what u meant? BTW, looking at the code again I just made a change, changing Math .max and .min to MathUtil .max and .min to eliminate unnecessary memory allocations. Haha, i was thinking about making that suggestion to u yesterday. Actually a direct if(a<b)=a would be faster. Also reverse the loop order. Regarding meshroundrect i was thinking about using the positions array calculated to avoid the “position” point request in the first loop. By any chance do u have in ur toolkit some basic drawing api for Meshes? As u have tons of experience with it. Not guys, I probably poorly explained. In fact, I cannot change the radius of the corners of the image with the gradien. But I needed to create this texture to apply a gradient. Texture can be created with MeshRoundRect. But as a matter of fact, if I can impose a scale9Grid on MeshRoundRect. In this case, I would not need to create a texture for the image and the radius of the edges could be changed dynamically. sclae9grid is only implemented in the Image class, to map the Texture uvs on within a specific rectangle region. So only works in Images with Textures. MeshRoundRect doesnt use a Texture, draws the mesh directly, like Starling Canvas does. Is like a Quad with lots of triangles to draw the round corners (instead of 2, like Quad or Image). Being a Quad, a MeshRoundRect or a Mesh... well everything is a mesh, so Johns gradient works with or without texture. In this case, the class Rodrigo with a gradient must be included in the starling extensions.